WR Bennie Fowler vs. CB Trevor Williams – Fowler gets thrown into the fire in Week 7 due to minimal wide receiver depth and an injury to WR Emmanuel Sanders. Fowler hasn’t been great for his quarterback this season, as quarterbacks have just a 63.9 passer rating when targeting Fowler, including four interceptions. He caught just three of eight targets last week, and things aren’t likely to get any easier this week against Williams. Williams has an overall grade of 85.6 this season, ranking 11th among all cornerbacks. He’s allowed a passer rating of 57.1 when targeted, 18th best among 110 cornerbacks with at least 70 coverage snaps. 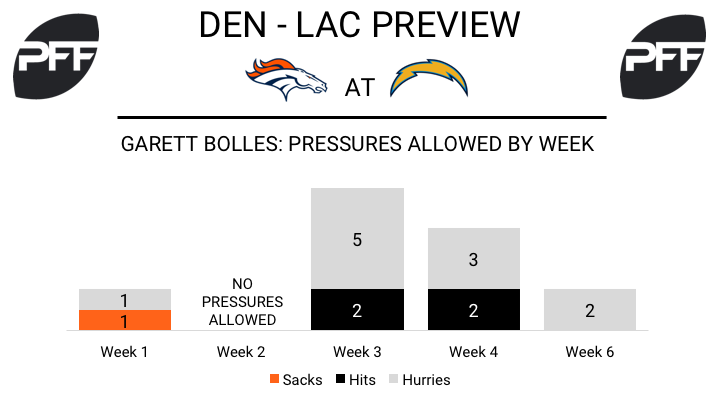 T Garett Bolles vs. Edge Melvin Ingram – The Broncos’ rookie left tackle faces one of the top edge rushers in the league this week. Ingram has recorded 29 total pressures this season, the fourth most among all edge defenders. Bolles has been a bit below average in pass protection this season, with his pass-blocking grade of 62.5 ranking 42nd of 68 tackles. He’s allowed 16 pressures, though just one sack, in 205 pass-block snaps. He’ll have his work cut out for him this week as he tries to build on his productive Week 6, when he allowed just two hurries on 58 pass-block snaps. RB C.J. Anderson vs. LB Hayes Pullard – Anderson is coming off his lowest yardage output of 2017 as he looks to bounce back against a Chargers defense that has struggled to stop opposing running backs. Pullard has six missed tackles this season and ranks 82nd of 83 linebackers with an overall grade of just 32.4. Anderson has graded as the sixth best running back (83.0) and is averaging 2.99 yards after contact per attempt, fourth most among running backs with at least 60 attempts. 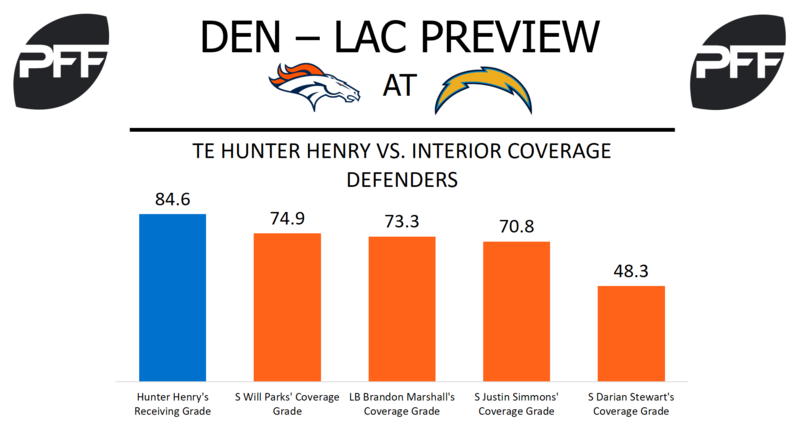 TE Hunter Henry vs. Broncos middle field defenders – Through the first four weeks of the season, Henry’s yards per route run sat at 1.55, good for 14th among qualifying tight ends, a respectable if somewhat disappointing position given his number (1.99) and ranking (sixth) last year. These last two weeks have seen that number rise to 2.32, good for fourth among tight ends during that time span. He matches up well against one of the few (possibly the only) weakness of the Broncos defense- middle of the field coverage. They are strong against the run and very strong on the outside with a trio of corners (Talib, Harris Jr., and Roby) ranked in the top 37 of cornerback coverage grading. LB Brandon Marshall is 39th in coverage grading among qualifying linebackers (73.3), and safeties Justin Simmons (70.8) and Darian Stewart (48.3) are not in the top 50 of safety coverage grades this season. Safety/dime linebacker Will Parks (74.9) is, but still clocks in at just 44th. Expect Antonio Gates to get work too. RB Melvin Gordon vs. DI Adam Gotsis – It’ll be Gordon versus an army really. Denver has no less than four interior defenders ranked in the top 30 in run-defense grade, and both of their starting edge defenders (Von Miller and Shaquil Barrett) rank in the top 14 of edge defender run grades. Gotsis stands out among them for leading the group in run-stop percentage at 12.3 percent. The Chargers would be better served getting Gordon the ball through the air, and he has been efficient this year as a pass catcher, his 1.57 yards per route run ranks 21st among running backs. QB Philip Rivers vs. CB Chris Harris Jr. – Harris Jr. has been one of the premier cornerbacks in the NFL the last few years, but Rivers has yet to find a cornerback he won’t throw on with regularity (sometimes to his detriment). To that end, Harris Jr.’s second lowest game grade of the season came Week 1 versus the Chargers and Rivers, and much of that was likely due to WR Keenan Allen scoring a touchdown with Harris Jr. in primary coverage. With CB Aqib Talib playing possibly the best football of his career right now, it’s likely that Harris Jr. will see some targets his way, as the offense can’t be 100 percent running back check downs and tight end targets.